This site is a tribute to all the men who served on the USS Reid 369. ANNOUNCEMENT: The USS REID 369 site has been permanently archived at the University of Massachusetts Library at the Gardner/Wilson Collection of the USS Reid 369. The site is shown below and can be found at: View the Archive. The collection is named after Leonard Gardner, USS Reid 369 shipmate, and James M. Wilson III, son of James M. Wilson Jr. (Willie Wilson) a USS Reid 369 shipmate. Both Gardner and Wilson are graduates of the University of Massachusetts. Gardner a B.A. 1949, and Wilson a PhD in 2000. 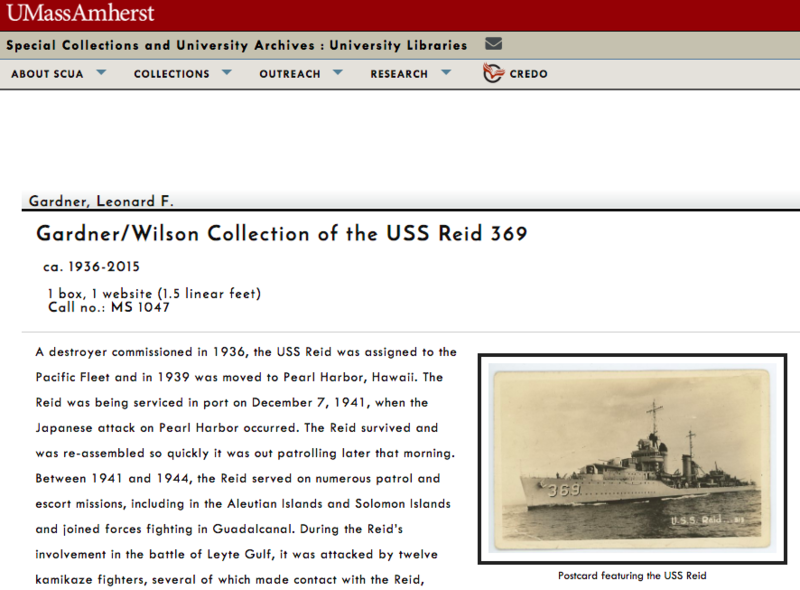 The University Archive was kind enough to give the USS Reid 369, with its website and photographs, a permanent home. Funding for this website and archive, contributed by survivors of the USS Reid 369, has been donated to the University to preserve the Reid materials and support archiving World War II materials. This website will continue to be available on the Web. 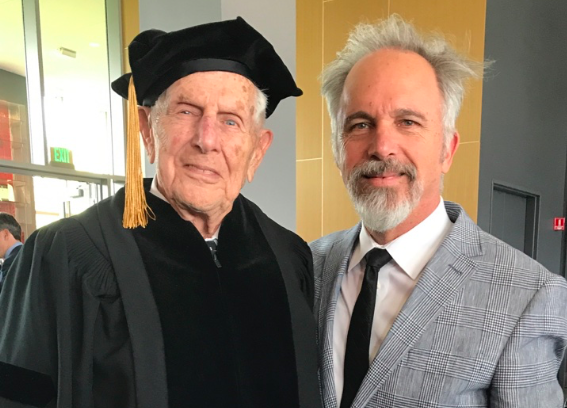 Leonard Gardner was celebrated, along with the USS Reid 369, with an honorary doctorate in May 2018 at the University of Massachusetts at Amherst. The picture below shows Gardner and Wilson at the event.